AVPro Edge AC-MX44-AUHD-HDBT 4x4 HDBaseT Matrix Switch with ICT/HDMI/IR/RS-232/Audio Matrixing is a true 4x4 HDMI/HDBaseT matrix switch. This unit includes 4 HDMI inputs, and 4 HDMI/HDBaseT output blocks. These output blocks include a HDBaseT and HDMI port, these ports are mirrored, and both are active. This Matrix supports HDMI 2.0(a/b), HDCP 2.2, up to 4K video resolution, and up to 18 Gbps bandwidth. We are able to pass 18Gbps through category cable by using the new HDBaseT technology we have developed called "ICT", learn more about ICT below. This switch allows any source (Blu-ray, UHD Blu-ray, satellite receiver, game consoles, PCs, etc) to be shown on any of the connected displays. This matrix equalizes and amplifies the output to ensure the HDMI signal can be transmitted through long HDMI cables without loss of quality. Audio Delay is "On-Board" so you can manage lip-sync issue before it is a problem. Also with built in Scalers you don't have to forfeit that 4K signal just because you have a couple older displays. All that with Full EDID management allows maximum flexibility with today's wide mixture of sources and displays. 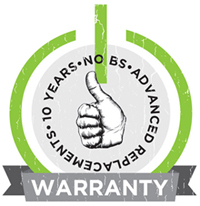 HDBaseT Compatibility Mode (HDBT-C) : This EXCLUSIVE AVPro Edge technology allows you to convert high bandwidth signals that are between 9 Gbps - 18Gbps like UHD Players, HDR Content, Gaming Systems, PC's, and Media Players. The conversion uses a proprietary algorithm that impacts the original image a little as possible so you can transmit your HDR and high bandwidth signals over long distance transmission to a display that supports 4K but does not support 18Gbps. 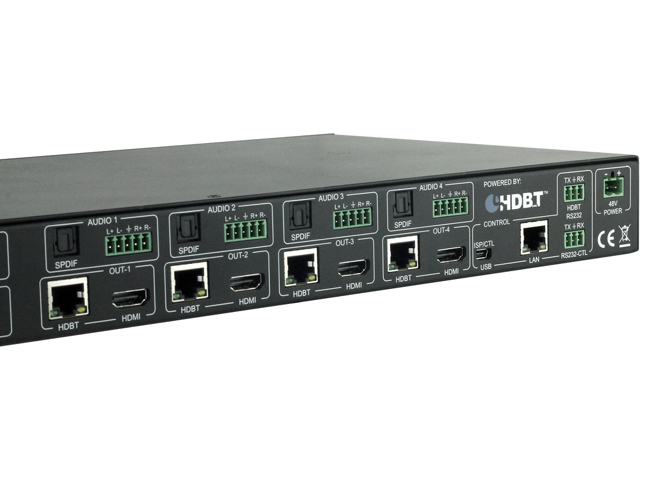 Best of all, this is managed on a per output basis so you have complete control over what individual runs are "down-clocked"
ICT Technology on the HDBaseT Outputs : ICT(Invisible Compression Technology) is a revolution in HDMI extension technology. This proprietary technology can compress high bandwidth HDMI signals into a more manageable size to fit through a CAT Cable "pipe". The ICT algorithm can manage all flavors of HDR including 4:4:4, 4:2:2, and 4:2:0 as well as signals up to 18Gbps and 4K 60Hz 4:4:4. The architecture of ICT allows it to be compatible with all chroma subsampling types, color spaces and HDMI Deep Color up to 12 Bit. Our technology is unique because it is truly invisible. It is not only invisible to the human eye, it is invisible to HDMI test gear and other sink devices, what comes in is what goes out. What makes ICT special is that we preserve HDR Metadata and color information and depth in its full, original, integrity. Other compression technologies sacrifice these to save space and it will cause very visible banding, color shifting and motion artifacts in the image. 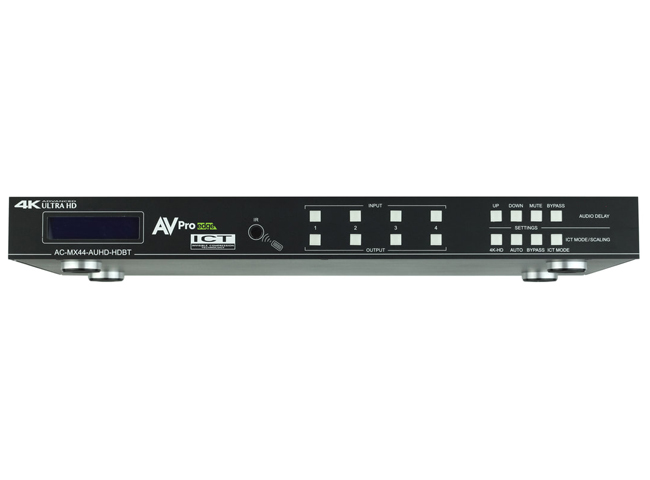 4K Up/Down Scaling : Like other AVPro Edge Matrix Switchers this unit comes with scalers built in. You are able to Upscale at the HDMI output 1080p > 4K. With the HDBaseT outputs you are able to scale 4K>1080p. There are limitation to scaling with this unit, you are not able to downscale on the HDMI outputs, and you are not able to upscale on the HDBaseT outputs. It features 4 digital optical toslink outputs for with support for 7CH LPCM, Dolby Digital, Dolby Digital +, DTS, DTS Master Audio. Audio Delay : With the AC-MX44-AUHD-HDBT you can manage audio delay on the balanced or digital outputs per output. This features up to 630ms of delay so your lip sync problems simply vanish. Audio delay can be managed directly from the front panel for ease of use and simple setup with the push of a button. Built In Test Pattern : The unit features an internal test pattern that can be initialized to verify that the infrastructure after the Matrix is in tact. This saves hours of painful troubleshooting, and allows you to identify problems before they become problems. Pattern is per output. Driver Support for Crestron, C4, RTI, ELAN and more!!! Why not buy this AVPro Edge AC-MX44-AUHD-HDBT 4x4 HDBaseT Matrix Switch with ICT/HDMI/IR/RS-232/Audio Matrixing today?